Minimum Weight: 7 lbs. 4 oz. Pack Weight: 7 lbs. 14 oz. Floor Area: 49 sq. ft. 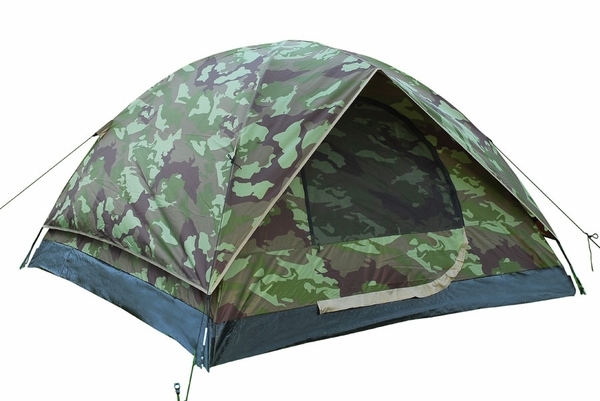 Pack Size: 18" x 7" x 7"
Woodland camouflage blends in with wooded surroundings in this backpacking dome tent. It comfortably sleeps 2-3 people and protects them with an extended rainfly that keeps water from coming in under the fly and a raised bathtub floor which eliminates water seepage. Built-in storage pockets and a gear loft maximize space in this tent that has a pack weight of 7 lbs. 14 oz. Tent package includes a tent-bag, a pole bag, a stake bag, extra stakes, and guy lines for windy conditions. My son got one for Christmas and is very excited about it. He does not like all tents picked out for him. Got it cheaper here than the price at a store in town and was afraid it would be cheap so was surprised when he took it out of box. Give it a good thumbs up. I havent been able to take this tent on a camping trip yet, but Ive tested it out at home. It sets up easily, and the quality is great. The zipper door works perfectly. The tent is a bit heavy rolled up, but its got plenty of space for three people and camping gear. My son is in the Boy Scouts, and he uses this tent. He took it on a troop camping trip where it snowed on them one time. It did a great job keeping the snow out. The tent is perfect for him because its waterproof, wind resistant, and sturdy. Its light, which makes it great for backpacking, climbing, and car camping. The zipper works great too. This tent is worth recommending. This tent works really well. I used it several times in 6 months, and it performed perfectly every time. Its very comfortable and easy to put up and take down. My sister has another model from this manufacturer, and she loves hers as much as I love mine. I haven't taken this tent on a camping trip yet, but I did set it up. There's so much room! For the price, this seems like a great tent. I'll let you know what we think after our first camping trip! Boys love anything camouflage so I bought these dome tents for our Boy Scouts. Boys can also be hard on everything, but these are really well made and sturdy with better quality material like using steel for the pegs instead of aluminum. We were able to sleep three boys in each tent and may have been able to squeeze in a fourth. The seven-foot square tents are about seven pounds, so they were too heavy for a backpack trip. We had good weather so we didnt need to use the stakes and tie downs. We also werent able to test out the windows and rain fly. If it is windy or rainy I may discover some problems. But I really dont expect to. This is a great tent! It is built well with screens and zippers and has good ventilation. You should seal the seams before you go out though. I am an experienced back packer and I think that this tent is worth carrying the eight pounds or so. It has easy and fast set-up. I would rate it as a 2 person tent plus a dog, not a 3 person tent. I like to be comfortable in tents. But, overall, this tent is really good value for the price. No complaints! This tent is simple to put up, and its very light yet strong. Great tent for the money. I'm pleased with the overall quality of the tent for what you pay, and I like the look of the tent with the camo. But the zipper flap constantly gets in the way of the zipper. The zipper works fine, but you have to use it slowly to keep from getting the flap stuck inside it. The tent designers need to use better flap material or something. This tent proved to be everything it claims. Its light and sturdy, it keeps the water out, its easy to put together, and its pretty comfy. Unfortunately, the zipper doesnt always work very well, but its fine as long as you work it slowly. The tent was delivered on time. The instructions tell you that the insert tabs for the poles are blue, but theyre beige. Still, the tent was quick and easy to construct. Theres plenty of space in the tent. Would recommend it. This tent is well ventedjust what I wanted. Its also light and sets up very easily. Id like the zipper door to be larger, but it seems that all lower price tents usually have smaller flies like this. Oh well. Id recommend this tent anyway. This tent did a nice job housing 3 adults on a backpacking trip. All of us found it quite comfortable. The tent is a little heavy to pack, but thats what you can expect from a sizeable 3-person tent. The camo is great! I found this tent to be solid and had no difficulty setting it up. It works well in the backyard or for car camping. Great little tent for the money. This tent accompanied me on a hiking trip in Black Hills National Forest. Though small and easy to pack on my back, its just the right size for my 6 3 frame and my gear. If youre taller like me, youll need to lie in the tent diagonally, and its probably only big enough for you. Since part of the roof is only a screen, you might want to purchase a tent cover to keep out rain and provide shade. The tent is easy to set up and only took me 15 minutes. The quality seems good, and I havent found any manufacturer defects. This tent is definitely worth recommending to others. I purchased this tent in December for my brother. Although he's used it quite roughly, it has held up well through some severe winter weather. I was hoping to use this tent on my overnight hunting trips. However, the roof isnt solid, so it doesnt keep out wind or rain during the cold hunting season. Still, its fine for ones kids in the backyard during the summer. I couldnt recommend it to a friend.